The AT Pro, was my favorite coin, jewelry and water hunting machine. It had incredible audio in Pro Mode utilizing iron audio to distinguish ferrous/nonferrous targets, especially useful when used to search for silver and copper coins. The AT Pro has notching abilities, in that you could pick a specific target, identified by the corresponding number readout (VDI) and either remove it, with no loss of depth, only the audio, or.....you could isolate only the readout number, making it easier to find a specific target like a lost earring or ring. The AT Pro was the recommended salt water metal detector, and when set up properly would work well in most salt water environments. The AT Gold was not recommended for salt water usage. Garrett's latest introduction model of metal detectors is the new "AT MAX." It was designed to posses the "best" options from both the AT Pro/AT Gold, and tweaked to squeeze out even more depth using the current available Garrett Search Coils. There are also after market coils available for those who even want to go deeper. The new "Garrett AT MAX." also included some entirely new features: Click on link for more information on the new features. -Fully submersible to 10-foot (3 meter) depth. Weatherproof design also protects against dusty and humid environments. -Digital Target ID—0 to 99 scale. -44 points of iron resolution. -Search Modes: True All-Metal, Custom, Coins, and Zero Discrim Modes. I received the new AT MAX at the beginning of August, opened it and had it assembled in about 30 minutes. The official instructions were not available at this time, however, I did receive an unedited photo copy. Very simple, precise with pictorial instructions. I put it through some air tests, to assess it's possible maximum detection depth. I tested various objects in both true all metal mode and discriminate mode. 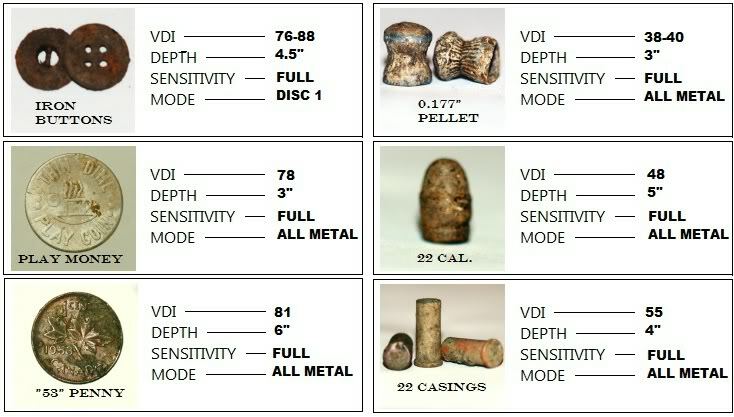 There was a definite increase with depth on the AT MAX over similar tests with the AT PRO and AT Gold in both discriminate mode and true all metal mode. The iron audio was more pronounces on the new AT MAX, possibly a bonus for relic hunters. The modulated audio (shallow targets produce a stronger signal, deep targets produce a softer signal) was apparent in both true all metal mode and discriminate mode. It could be enhanced using the "Adjustable Threshold" feature to hear those soft whisper. Please note that the "Adjustable Threshold" feature only works with true all metal mode. This feature assists with location very deep signals and is often utilized by relic and gold nugget hunters. Realistically, I can't judge a new metal detector with one or two outings. I have to do several hunts in order to really get a feel for it, and I always figured a person must get a good hundred hours on a metal detector before you can say you have mastered it. 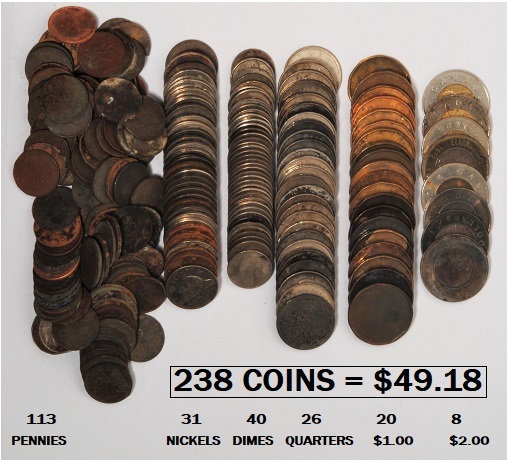 Above are my total clad found in one month, after several hunts including land and fresh water lake hunting. I hunted parks, woods, construction sites and along a river. During one hunt, my buddy, with his AT Pro, 8.5" x 11" DD coil and my AT MAX exact same set-up, compared signals on three different coins. Before it was dug, I got him to raise his 81/2" x 11 DD coil above the coin to where the audio stopped. After measuring the height, I used the AT Max, used the same configuration, and twice I gained an extra 3" and once 2 1/2 inches above the ground beyond where is coil lost the signal. This again, validated what myself and others have noticed with the increase in depth over the other AT Series Detectors. Coins banged hard, and the modulated audio was apparent on the deeper coins. I did manage to find some silver coins. 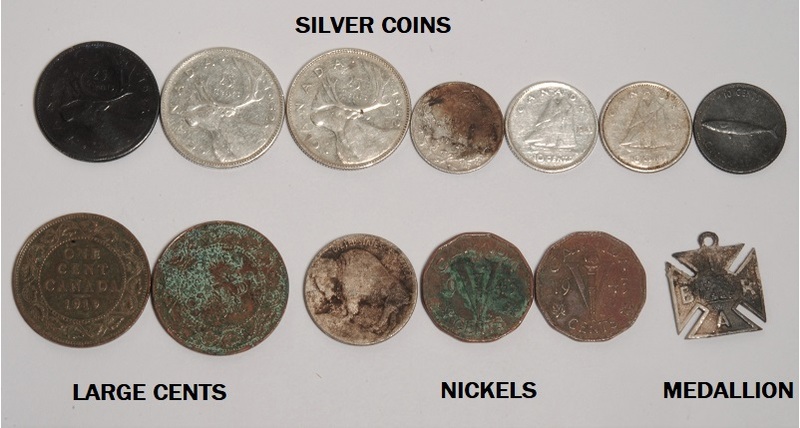 Two coins (dime, quarter and Buffalo Nickel) were found in a fresh water lake, over 8" down. Old coins just don't come out of this very popular beach. My favorite coil for all the AT Series is the 9" x 12" Concentric coil. It just seems to give me better depth, more accurate target ID and faster/easier pinpointing. It's not the best for target separation. A smaller coil and or DD usually gives better separation. An experience hunter chooses his coils wisely for the job. Now this is in my soil, which ground balances to about 90. 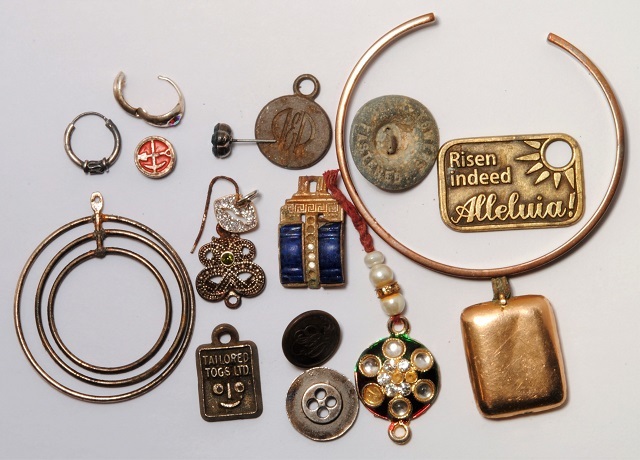 Even though this coil is the largest coil for the AT Series, it still manages to find tiny targets, as shown in the jewelry finds. Small earring still give up a nice sharp high tone. Here are the rings I found. 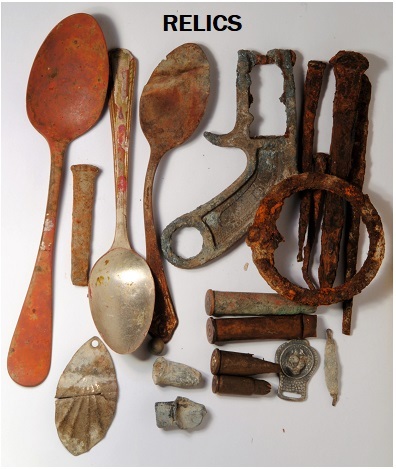 Two were found on land, the rest were found in fresh water. The AT MAX works just as good in the water as it does on land. To prevent problems water hunting, you need to check that all your connections, coil and headphones, are tight, and it's good to use a little silicone gel on the "O" ring to keep it from drying out. I can honestly recommend the AT MAX as a great metal detector, made by Garrett Metal Detectors out of Garland, Texas. This is the same company today, which has been producing metal detectors since 1964. Garrett holds many patents, and is known for developing cutting edge technology, which has been shared and built upon by most metal detector manufacturers. The AT MAX is an excellent metal detector, both on land and water. The programs are easy to master, and when used properly, should fulfill your hunting niche plus much more and give you many years of problem free metal detecting. Check out their website, and find out where the nearest dealer is to purchase such a fine metal detector. Edited 1 time(s). Last edit at 09/06/2017 11:08PM by John-Edmonton. What a bunch of bull. they DO NOT WORK IN SALT WATER YOU FOOLS.